The new Stompin Tom Center in Skinner's Pond, PEI has become a major attraction for tourists and local people and by all accounts the center has become beyond belief. Every day , 7 days a week hundreds of people visit the center and are wrapped up the legacy of Stompin' Tom Connors. A real treat for the visitors is a presentation of songs and stories of Stompin' Tom by Kurk Bernard at 1-2 pm every day. Kurk sings the songs of Stompin' Tom and does an outstanding job of Toms songs. Two different Dinner Theatre Productions about Stompin' Tom are presented during the week. Every Friday and Saturday is music night and presented by mostly Island music artists according to Tom's wishes. Visitors can visit the School where Tom attended, the museum of all Tom's awards and so on, sing in the special booth Tom's songs and have lunch to your hearts content. Surveys show that those attending come from all over Canada, US and beyond such as India, Australia, The Yukon and so on. Here is an excellent review by Jan Cox of The Buzz in Charlottetown. The show begins with the final song from Stompin’ Tom at a Prince Edward Island concert. We move to a house party in Skinner’s Pond that was supposed to be a secret. But in fact, everyone turns up to talk to Tom and hear him play a few tunes. Ms Dunn Keefe has written a hilarious script. Chad Matthews excels at portraying Stompin’ Tom. Chad obviously studied Tom Connors’ mannerisms, personality and musical style. Different conversations from an excellent supporting cast evoke in Tom a memory, a story and ultimately a song. 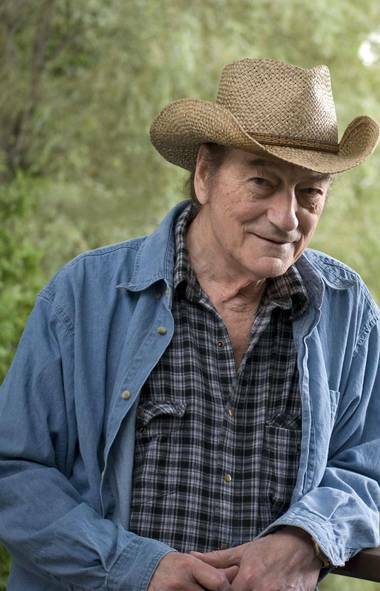 Stompin’ Tom’s life story is expertly woven through those stories and especially the songs. Special mention goes to cast member Paul Shea as Bernadine Doyle. Bernadine’s antics will keep you rolling in the aisles! The cast also serve the meal, and they are excellent at it. The dinner, catered by Sonrise Catering, was lovely—fresh and hot. Our thanks to Chef Carol Chaisson and her business partner Darlene Getson. 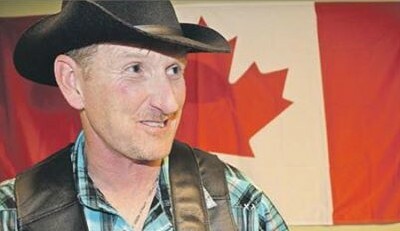 Chad Matthews as the man himself, Stompin' Tom Connors. This play is a fitting tribute to Canadian legend, Tom Connors. The actors are local folks and should be applauded for their wonderful ability to entertain and make their guests (audience) feel so genuinely welcome. There are two different plays, My Island Home and the one we attended, playing throughout the summer. Visit www.stompintomcentre.com for details.‹‹Great Scot!